An artist's illustration of Astrobotic's CubeRover (foreground) and Peregrine lunar lander on the surface of the moon. It's called CubeRover — a novel small rover platform for the moon. The Pittsburgh-based company Astrobotic, in partnership with Carnegie Mellon University, has won a NASA Phase II Small Business Innovation Research (SBIR) Award to develop this 4.4-lb. (2 kilograms) rover platform capable of small-scale science and exploration on the moon and other planetary surfaces. 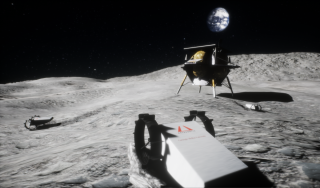 "CubeRover stands to give more people access to the moon than ever before," Andrew Horchler, principal investigator of the program at Astrobotic, said in a statement. "Countries and organizations without multibillion-dollar budgets now have a means of exploring other worlds for the first time." Astrobotic is an official NASA partner via the Lunar CATALYST program. The company has 24 prior and ongoing NASA contracts, a commercial partnership with Airbus DS, a corporate sponsorship with DHL, 11 deals for its first mission to the moon and 130 customer payloads in the pipeline for upcoming missions, Astrobotic representatives have said. The Phase II SBIR award will allow the company to press forward with a rapid, two-year development to deliver a flight-ready rover to NASA, Astrobotic representatives said. The company intends to fly the first CubeRover on the company's Peregrine lunar lander in 2020. Those first missions will likely be short — even shorter than one frigid lunar night, which lasts about 14 Earth days. "Like NASA lunar missions (e.g., Resource Prospector) and Astrobotic's own Peregrine lander, we do not anticipate surviving the night," Astrobotic's Carolyn Pace said via email. "The rover will go into hibernation mode when power levels and temperatures drop below a threshold. We will attempt to re-acquire contact on the following lunar day, but there is no guarantee for long-term survivability." CubeRover's low cost is an advantage relative to larger systems that cost $100 million or more, Pace added, "and still cannot guarantee surviving lunar night. In future missions, CubeRovers will be designed to take advantage of lander-based systems to shelter for the night. In addition, larger CubeRovers will allow for more thermal insulation and will be able to carry heavier electronics and batteries custom-designed and qualified for ultra-low temperatures. Astrobotic has previously done research in this area."